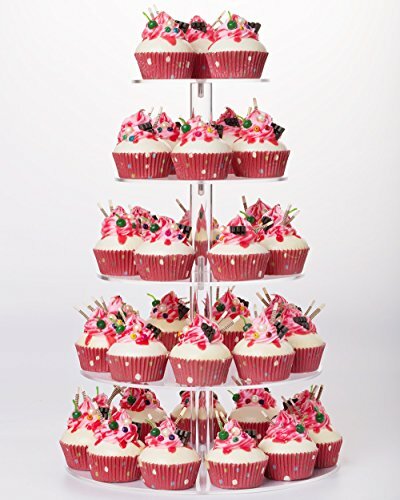 Wilton 3-Tier Cupcake Stand, WhiteCategory: Cake TowerThis Wilton Cupcake Stand is disposable and easy to personalize. Once assembled, you can decorate the scalloped border strips with a message and decorative accents. 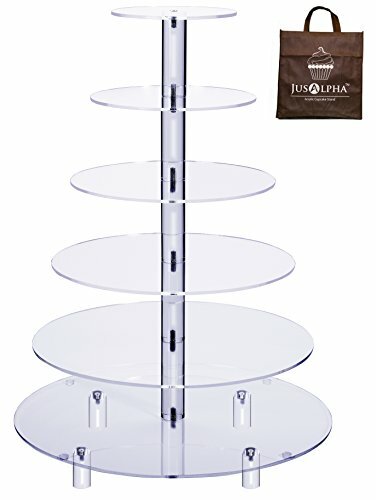 This disposable cupcake stand holds 24 sweet treats. It gives you an easy way to display cupcakes in a compact space. It is ideal for use at bake sales or parties. 7 Tier Round Clear Acrylic Cupcake Stand Wedding Party Display Cake Tower Stand ECBYCategory: Cake Tower100% Brand New. 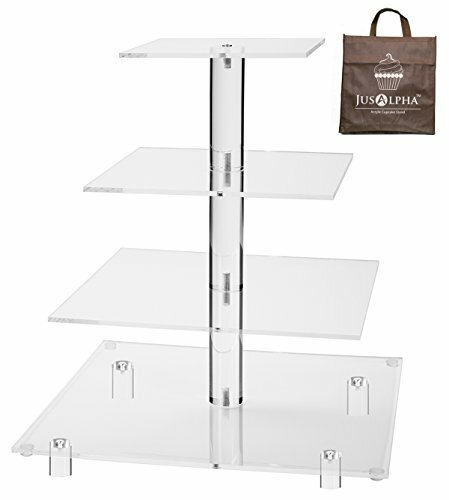 Material: Food Grade Acrylic Color: Transparent Size: 1st tier 5.9inch/15cm 2nd tier 7.5inch/19cm 3rd tier 8.8inch/22.5cm 4th tier 10inch/26cm 5th tier 11.8inch/30cm 6th tier 13.4inch/34cm 7th tier 14.8inch/37.5cm Height of each tier: 4inch/10cm STABILITY : By using Acrylic Rod with Screws instead of Tube to make this cupcake stand straight and stable OCCASION : High transparent acrylic to make this europe stylish cake stand,ideally for various events such as wedding,engagement,birthday,party,baby shower,Christmas etc PACKAGE : Customized carton for per unit,completely protect every plates of the whole cake stand,you don't need to be aware of damage when shipping,also we have good after sale service,we'd like to hear every client's suggestion or complaints and we fix all for you. 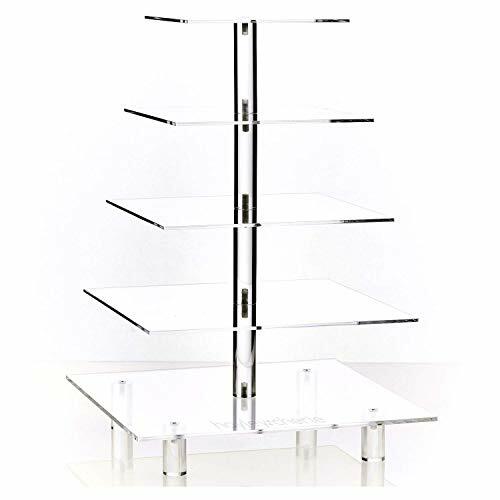 3/4/5/6 Tier Clear Acrylic Cake Stand Round Crystal Acrylic Sheet Cupcake Tower Stand Wedding Birthday Party DecorationCategory: Cake TowerFeature:-Acrylic, also known as PMMA or acrylic, from the English acrylic (acrylic plastic). Has good transparency, chemical stability and weather resistance, easy to dye, easy processing, beautiful appearance, in the construction industry has a wide range of applications.-With crystal-like transparency, light transmittance of 92% or more, soft light, visual clarity.-Has excellent weather resistance, high surface hardness and surface gloss, and good high temperature performance.-Acrylic cake rack, widely used for personal birthday party, birthday, celebrations, banquets, marriage, graduation ceremony. Used to display merchandise, play a very good decorative effect.-How to clean:-With cotton cloth dipped in warm water can be wiped, the fabric surface can not be rough, easy to scratch the surface, the water temperature can not be too high, easy to damage the disc. Household detergents can also be used for cleaning.-How to save:-After the best use of each layer wrap with plastic wrap separately, or every two layers of the middle of electric cotton cloth, wipe clean the screw, into the carton sealed, so hygienic and difficult to damage.-Not the sun for a long time exposure, easy to yellow, and may be deformed, acrylic plastic products, after all, under normal circumstances this rarely occurs, please know.Specifications:Product name: Cupcake StandMaterial: AcrylicColor: TransparentCake Stand Type: 3 Tier, 4 Tier, 5 Tier, 6 TierPackage Include:1x Acrylic Cupcake StandThe Round Crystal Clear Acrylic Cupcake Tower Stand Wedding Display 3,4,5,6 Tier is great for displaying cupcakes, wedding cakes, disserts, cookies and other treats.And the cupcake tower stand will let all your scrumptious cupcakes stand out.Whether for weddings, birthday parties, college events or anniversaries, this acrylic cake stand will be a focal point of any special occasion. Each tier is round and crystal clear so the stand is able to beautifully showcase delectable cupcakes or a wedding cake. 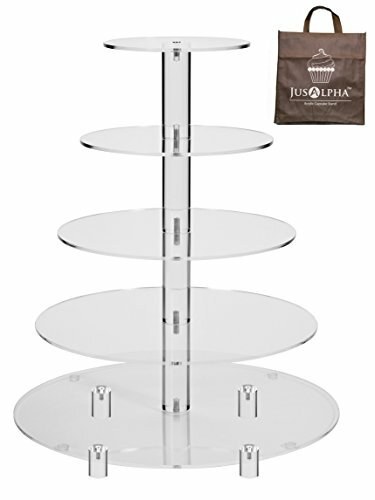 This stand is customizable so you can pick and choose the number of tiers needed to accommodate your cake. 3/4/5/6 Tier Clear Acrylic Cake Stand Round Crystal Cupcake Tower Stand Wedding Birthday Party DecorationCategory: Cake TowerFeature:-Acrylic, also known as PMMA or acrylic, from the English acrylic (acrylic plastic). Has good transparency, chemical stability and weather resistance, easy to dye, easy processing, beautiful appearance, in the construction industry has a wide range of applications.-With crystal-like transparency, light transmittance of 92% or more, soft light, visual clarity.-Has excellent weather resistance, high surface hardness and surface gloss, and good high temperature performance.-Acrylic cake rack, widely used for personal birthday party, birthday, celebrations, banquets, marriage, graduation ceremony. Used to display merchandise, play a very good decorative effect.-How to clean:-With cotton cloth dipped in warm water can be wiped, the fabric surface can not be rough, easy to scratch the surface, the water temperature can not be too high, easy to damage the disc. Household detergents can also be used for cleaning.-How to save:-After the best use of each layer wrap with plastic wrap separately, or every two layers of the middle of electric cotton cloth, wipe clean the screw, into the carton sealed, so hygienic and difficult to damage.-Not the sun for a long time exposure, easy to yellow, and may be deformed, acrylic plastic products, after all, under normal circumstances this rarely occurs, please know.Specifications:Product name: Cupcake StandMaterial: AcrylicColor: TransparentCake Stand Type: 3 Tier, 4 Tier, 5 Tier, 6 TierPackage Include:1x Acrylic Cupcake StandThe Round Crystal Clear Acrylic Cupcake Tower Stand Wedding Display 3,4,5,6 Tier is great for displaying cupcakes, wedding cakes, disserts, cookies and other treats.And the cupcake tower stand will let all your scrumptious cupcakes stand out.Whether for weddings, birthday parties, college events or anniversaries, this acrylic cake stand will be a focal point of any special occasion. Each tier is round and crystal clear so the stand is able to beautifully showcase delectable cupcakes or a wedding cake. 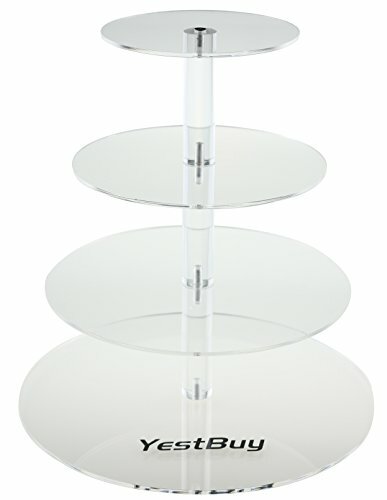 This stand is customizable so you can pick and choose the number of tiers needed to accommodate your cake. Crystal Metal Cake Holder Cupcake Stand and Towers Dessert Display Stand for Birthday Wedding PartiesCategory: Cake TowerSpecification:Type:Cake StandMaterial:IronMain Color:White,GoldQuantity:6Pcs/SetPackage Size(Approx):approx.42*36*23cm (1cm=0.39inch)Weight:about 4730gPackage include: 6Pcs Cake stand (NOT included the cake and other decorations)Features:-Easy to use and clean.-Beautiful design, perfect appearance.-Good helper to finish a cake or decorating wedding.-Application for placing cakes, pastries, fruit.-Perfect for Birthday, Wedding, Christening, Kitchen tea,etc.-Suitable for home,Dessert shops, cake shops, restaurants using. Crystal Metal Cake and Cupcake Stand & Towers Dessert Display Stand for Birthday Wedding PartiesCategory: Cake TowerSpecification:Type:Cake StandMaterial:IronMain Color:White,GoldQuantity:6Pcs/SetPackage Size(Approx):approx.42*36*23cm (1cm=0.39inch)Weight:about 4730gPackage include: 6Pcs Cake stand (NOT included the cake and other decorations)Features:-Easy to use and clean.-Beautiful design, perfect appearance.-Good helper to finish a cake or decorating wedding.-Application for placing cakes, pastries, fruit.-Perfect for Birthday, Wedding, Christening, Kitchen tea,etc.-Suitable for home,Dessert shops, cake shops, restaurants using. 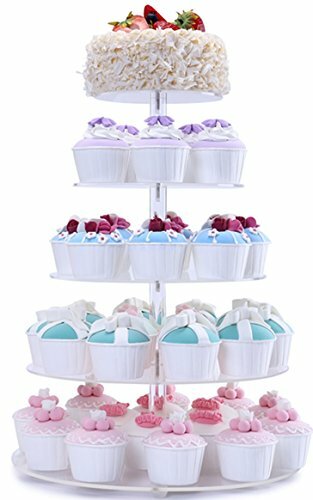 1Set/6Pcs Cake Holder Cupcake Stand and Towers Dessert Display Plates for Birthday Wedding PartiesCategory: Cake TowerSpecification:Type:Cake StandMaterial: Iron & CrystalMain Color:White,GoldQuantity:6Pcs/SetPackage Size(Approx):approx.42*36*23cm (1cm=0.39inch)Package include: 6Pcs Cake stand (NOT included the cake and other decorations)Features:-Easy to use and clean.-Beautiful design, perfect appearance.-Good helper to finish a cake or decorating wedding.-Application for placing cakes, pastries, fruit.-Perfect for Birthday, Wedding, Christening, Kitchen tea,etc.-Suitable for home,Dessert shops, cake shops, restaurants using. 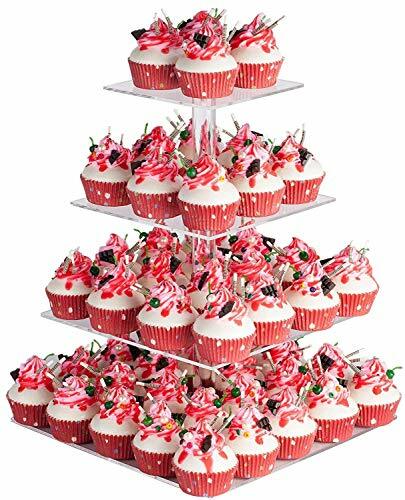 7 Tier Round Cupcake Stand Party Clear Acrylic Cake Tower Wedding Food Display Stand Cake Tree cbstCategory: Cake TowerLEANO 7 Tier Clear Circle Round Cake Stand Hot Style Wedding Birthday Display is easy to assemble with screws for strength and stability. In addition, the cake display is also easy to remove and clean. Wedding, birthday party, university event or anniversary, this acrylic cake cake will become the focus of any special occasions. Each floor is round and transparent, so the position can beautifully show delicious cake or wedding cake. This position is customizable, so you can pick and choose the number of layers required to fit your cake. Specification: 100% Brand New. 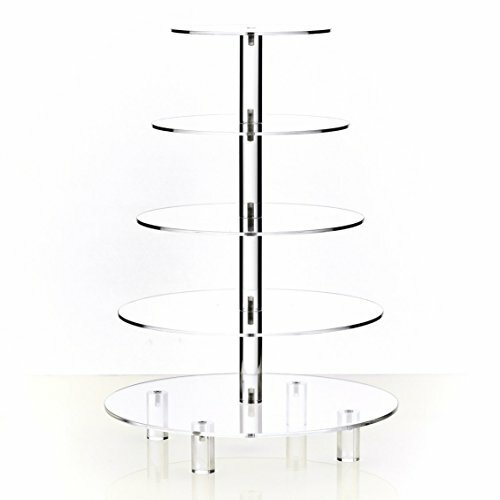 Material: Food Grade Acrylic Color: Transparent Size: 1st tier 5.9inch/15cm 2nd tier 7.5inch/19cm 3rd tier 8.8inch/22.5cm 4th tier 10inch/26cm 5th tier 11.8inch/30cm 6th tier 13.4inch/34cm 7th tier 14.8inch/37.5cm Height of each tier: 4inch/10cm STABILITY : By using Acrylic Rod with Screws instead of Tube to make this cupcake stand straight and stable OCCASION : High transparent acrylic to make this europe stylish cake stand,ideally for various events such as wedding,engagement,birthday,party,baby shower,etc PACKAGE : Customized carton for per unit,completely protect every plates of the whole cake stand,you don't need to be aware of damage when shipping,also we have good after sale service,we'd like to hear every client's suggestion or complaints and we fix all for you. 3/4/5/6 Tier Clear Acrylic Cake Stand Round Crystal Cupcake Tower Stand Wedding Birthday Party DecorationCategory: Cake Tower.Feature:-Acrylic, also known as PMMA or acrylic, from the English acrylic (acrylic plastic). Has good transparency, chemical stability and weather resistance, easy to dye, easy processing, beautiful appearance, in the construction industry has a wide range of applications.-With crystal-like transparency, light transmittance of 92% or more, soft light, visual clarity.-Has excellent weather resistance, high surface hardness and surface gloss, and good high temperature performance.-Acrylic cake rack, widely used for personal birthday party, birthday, celebrations, banquets, marriage, graduation ceremony. Used to display merchandise, play a very good decorative effect.-How to clean:-With cotton cloth dipped in warm water can be wiped, the fabric surface can not be rough, easy to scratch the surface, the water temperature can not be too high, easy to damage the disc. Household detergents can also be used for cleaning.-How to save:-After the best use of each layer wrap with plastic wrap separately, or every two layers of the middle of electric cotton cloth, wipe clean the screw, into the carton sealed, so hygienic and difficult to damage.-Not the sun for a long time exposure, easy to yellow, and may be deformed, acrylic plastic products, after all, under normal circumstances this rarely occurs, please know.Specifications:Product name: Cupcake StandMaterial: AcrylicColor: TransparentCake Stand Type: 3 Tier, 4 Tier, 5 Tier, 6 TierPackage Include:1x Acrylic Cupcake StandThe Round Crystal Clear Acrylic Cupcake Tower Stand Wedding Display 3,4,5,6 Tier is great for displaying cupcakes, wedding cakes, disserts, cookies and other treats.And the cupcake tower stand will let all your scrumptious cupcakes stand out.Whether for weddings, birthday parties, college events or anniversaries, this acrylic cake stand will be a focal point of any special occasion. Each tier is round and crystal clear so the stand is able to beautifully showcase delectable cupcakes or a wedding cake. 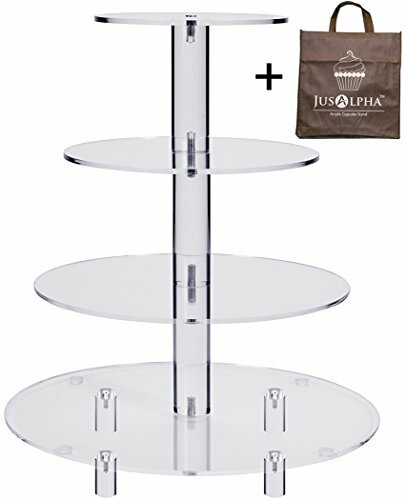 This stand is customizable so you can pick and choose the number of tiers needed to accommodate your cake. The EASIEST way to Tier a Cake! DIY DIPPED STRAWBERRY & ROSE TOWER - GORGEOUS!